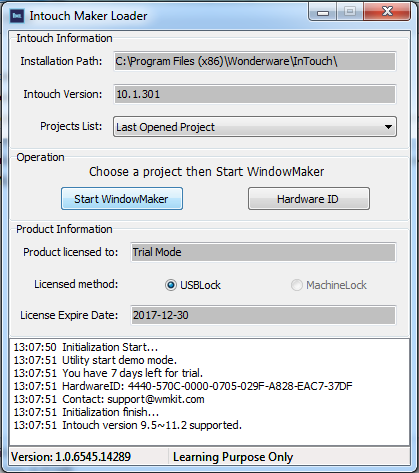 Window Maker Loader(ITLoadMaker) is a software that you can use it to start the Window Maker without the license of development license. 1、You only purchased the Runtime license, not able to use the Window Maker. 2、You Purchased the Dev license, but the Dongle is not at the hand. 3、Tired of switching license between Runtime and Dev license again and again. 1、You must have a valid Intouch Runtime license which able to start the Window Viewer. 2、The intouch version must above 9.5(included). 3、You must have a USB flash disk to Run this utility. 1、This utility is a shareware, so you need a ITLoadMaker license to start the ITLoadMaker. 2、ITLoadMaker will enter Demo mode whitout license, in Demo mode, the Window Maker will be randomly closed after 4 minutes. 4、The ITLoadMaker license must be placed together with ITLoadMaker. 6、We need your HardID to generate the license, you can find it on the ITLoadMaker.